The following is a short story I wrote last year based on some images that I created (shown above). I was looking for some inspiration and decided to try to write little stories to go along with some of my artwork. Once upon a time, in a land called Kynneset, there lived two unicorns. Both were young and beautiful, both loved the land in which they lived. Their lives were full of magic and the land was good to them. They frolicked with the creatures of the land and they were happy. 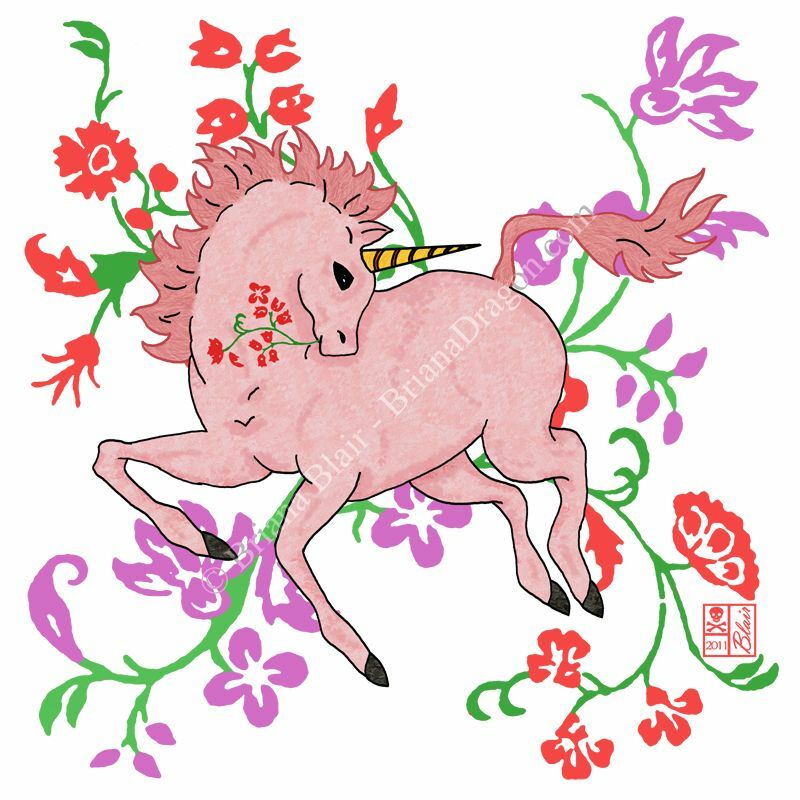 The pink unicorn liked to play in the daytime. She ran and bounded through the day-blooming flowers, feeling the warm sun on her face. She talked with the birds and squirrels and bees. The Day Mother guided and protected her, and there was joy in her heart. The black unicorn liked to play in the night time. She frolicked beside the night-blooming flowers, feeling the cool of the moon on her skin. She talked with the bats and wolves and spiders. The Night mother guided and protected her, and there was joy in her heart. In time, people came to Kynneset. The unicorns watched the people and it seemed that they were good. They worked the land and were good to it. They seemed kind to each other. Their days were filled with work and happy song, their evenings filled with dance and tales of their ancestors. The unicorns were happy to have the people in their land. After a time the unicorns got together and talked about the people. They decided that they would try to interact with them. To their knowledge, the people were not aware of the magical creatures of the land. They agreed to interact with the people, each on their own time, then come together and decide what they really thought about these new beings. A week later the two unicorns came together to talk about the people. The pink unicorn was very happy. She told joyful tales about her time with them. The adults were enraptured by her beauty and the children played with her in the fields. The people brought her fruits and vegetables as gifts, and made songs about her and the little woodland creatures. The black unicorn was not so happy. The people did not like her. They kept the children away from her, no one would play with her and there were no gifts. She heard them inventing tales of the dark beast that lived in the woods and talked with the evil creatures of the night. The pink unicorn could not understand this. “But you are my sister, my other half, and I am yours. How could they love me and not you? We are different, but we are the same. They should love us both.” The black unicorn agreed with her sister’s words, but her heart was heavy with sadness. Day Mother and Night mother listened to the tales their magical children shared. They though for a time on the ways of the people. These beings claimed to be of the earth, claimed to understand and respect its ways. So how could it be that they would embrace one of nature’s children and not the other? They decided that something must be done. Day Mother and Night Mother took a single form and went to the people’s village. The people were in awe at the presence. What they saw before them was a beautiful woman dressed in black and white, glowing yet in shadow, floating before them at the edge of the village. The Dual Mother spoke to the people. “We have come to speak with you about our children the unicorns. You have treated one with love, and the other with fear. Why is this?” “Great Mother,” one spoke, “The pink unicorn is a thing of beauty. It lives in the light and is good. We love it and welcome it. 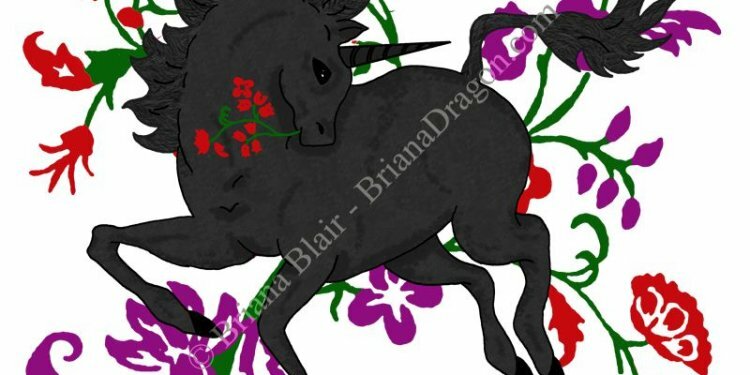 The black unicorn is not right. It lives in the dark and is evil. We fear it and do not want it near.” “What makes you think my night-child is evil?” the Mother spoke. “Do you think the night is evil? Do you think all things of darkness are to be feared?” “Yes Mother. Fearful things live in the dark. It is the time of monsters and evil ways.” “Oh, my child.” The voices of the Dual Mother said “You do not understand. Without darkness, there could be no light. Without the night’s rest there could be no play in the sun. Without the night’s creatures, the world would fall out of balance. Darkness and it’s inhabitants are not inherently evil, nor are things of the light inherently good. All is needed for balance.” The people thought about the Dual Mother’s words, and as they did she broke apart, revealing herself as the Night Mother and Day Mother. The people now saw that both halves made a whole, and they began to understand how both could work in harmony. From that day on the people respected the children of the Day mother and Night Mother alike. They sang songs of the black unicorn as well as the pink, and they made time for play and gave gifts to both. The unicorns became happy with the new beings of the land. They hoped that such peace and balance could exist for all time. All rights reserved by the author. No part of this publication can be reproduced, stored in a retrieval system, or transmitted in any form or by any means, electronic, mechanical, photocopying, recording or otherwise, without the prior permission of the publishers and/or authors. Wow, I really like your story! Excellent! Thank you. I really need to do more of this. I’ve done so much art, it would be great to have little stories to go with them. Not to mention, the stories are a great way to plug the art! Thank you very much. I hope it brought some happiness to you and your family.